The Class X Cub racer is one of the largest one-design racing fleets sanctioned by the International Lake Yachting Association in the Midwest. It was designed for sail training and racing on inland lakes in Minnesota and has been in production since 1932. It is a hard-chine, fractional sloop with clubbed jib, cast iron centerboard and rudder. There are several active racing fleets in the upper Midwest. Also sometimes called an "X scow" but it's not a scow, it's a sharp-pointed bow. Similar to a Snipe. This is a semi-project boat that needs some woodwork in the cockpit and spars. Someone with moderate woodworking skills will be able to refurbish this into a fine daysailer. 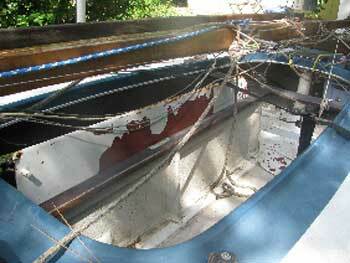 Hull: Fiberglass in good condition with no leaks. Some wear in the Automatic bailers. Additional foam floation added behind plywood panels under sidedecks. Plywood panels show some signs of delamination and will ultimately need replacement. Mast: Wood, bright finished. Varnish is in poor condition. The mast is made of three pieces of laminated wood; there is a section of rot about one foot long in one of the laminate sections at the tip of the mast that needs replacement. Alternately, the mast could be switched out to aluminum like current production models. Boom: Wood, painted dark brown. There is a crack immediately under the bolt rope track that needs repair. Sails: Look to be original. No holes or tears. Some minor stains. Serviceable. Jib club boom is wood, painted dark brown, good condition. Centerboard and rudder: Cast Iron. No rust seen. Could use grinding, priming and painting. The centerboard pin is easily accessible from the cockpit. Wood tiller with extension, painted dark brown. Rigging: Standing rigging (stays, shrouds, jumpers) are stainless wire rope, not original but age unknown, all in good shape with no rust or fishhooks. Running rigging is serviceable. Some newer blocks on sail and centerboard controls. 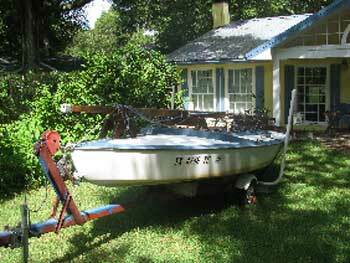 Outboard: Nissan 3.5 hp 2-stroke. Integral gas tank. Neutral and forward gears. Recently serviced and runs well. Trailer: Older painted steel trailer. 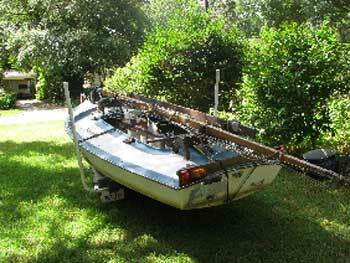 I just repaired the tongue-to-frame joint with a new connecting fastener and used the trailer to tow the boat 250+ miles (highway and secondary roads) and it did great, tows very well. Bearings recently greased. Tires in good condition. 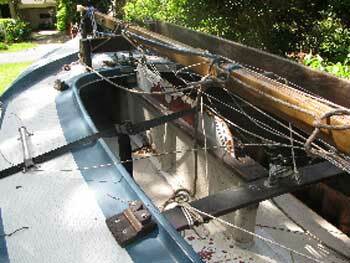 Winches in good condition, there is a second winch added for raising/lowering the mast. Custom-made light bar that rests on the stern deck of the boat (all lights work), and custom saddles to carry mast and boom. Other: I sailed this boat with my brother-in-law last year and it is very fast and responsive in light winds. This was with the noted mast rot and boom crack problems, and we had no problems, but I wouldn't recommend extensive sailing without this repair being made. We motored the boat about 2 miles to a ramp for removal one month ago and the outboard ran very well, and no leaks in the hull were noted. We took this boat in trade for a powerboat for my brother-in-law's use; we have a larger 32' sailboat so won't be using this boat, and I don't know that I have the woodworking skills to attempt the mast repair. Someone with moderate woodworking skills should be able to tackle this with no problem. Alternately, a used mast from another boat of similar width could be cut down to size (the current mast is 19'). We'd like to see the boat get some good use. Delivery can be discussed within a reasonable distance. We sold the X boat this morning! Thanks!